You can see it, can’t you? The resemblance? But only the BBC version. Only Colin. Years ago my mother, father, sister and I leaned closer and closer to the screen. Complete fascination. For you see, it really is a most wonderful story. Striking! They said. Amy married Mr. Darcy. And my father still calls him that sometimes. It’s more than just the remarkable similarity of appearance. But wait – there was more to Mr. Darcy, remember? He’ll move heaven and earth because it’s the right thing to do. He’ll go to great lengths to be a gentleman. He was the one who melted my heart. And he’ll smile when I clap my hands because I’m excited (then imitate me), and he’ll paint our bedroom pink because he knows I love the color. Mr. Darcy, this one’s for you. This entry was posted in Gregor, Valentine's on February 14, 2010 by maisymak. How did this never, ever, hit me before. Exactly. Exactly. Yes, I do see it. Amazying. And you are his Elizabeth – sweet, thoughtful, dedicated to family, a supreme sense of honor, with the cleverness and wit to explain to Darcy that you would play the pianoforte better if only you practiced; yet also kind enough to distract others from potential pain and be there to turn the page and help them through life’s rough spots – earning the love from all of all who know you, and the undying devotion of Darcy. Happy Valentine’s Day to the real life Elizabeth and Darcy. 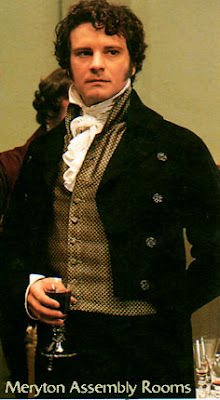 He does look like Mr Darcy!